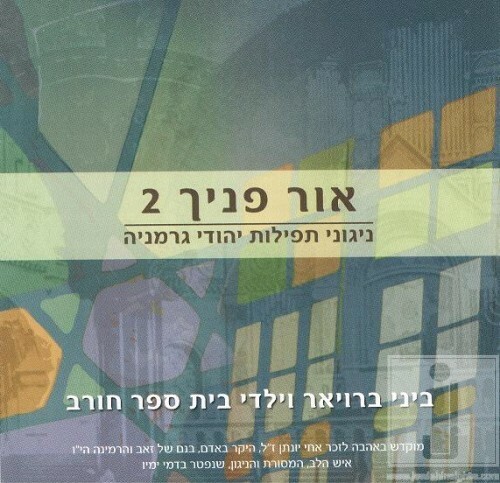 Bini Breuer is happy to release “Ohr Ponecho 2” – another album in a series of German Jewish prayer melodies.More than half the songs are performed with the children from Beis Chorev in Jerusalem. The album contains a selection of poems which circle the yomim toivim of the year: Kidushim, Shir Hamaalos, Yidgal, Lecha Dodi, Peiyutei Chagim, Hoitzoas Sefer Torah, Anim Zemiros and more.The inner cover of the album will include additional attachments explaining everything. The main purpose of creating this album is to spread the glorious heritage of German Jewry that has been forgotten or lost. The album can be obtained by calling: 050-5715001.